Today is Halloween, so my topic is predictable: ghosts. A few days ago the British newspaper The Independent had an article entitled Do you believe in ghosts? Leading psychologist claims it's 'all in the brain.' The article then discussed the views of Christopher French, head of the Anomalistic Psychology Research Unit at the University of London. French champions the theory that ghost sightings are caused by psychological issues in those who report the sighting. that people typically label as paranormal. Also, the front web page of this unit's web site brags that French is a “Special Advisor and former Editor-in-Chief of The Skeptic Magazine, the UK's foremost and longest-running sceptical magazine.” It even includes a large cover photo of The Skeptic magazine in the middle of the text describing the unit's mission. Since magazines such as The Skeptic are famous for being rigid, inflexible scorners of all things paranormal, and since the very thing French's unit is investigating involves claims of the paranormal, it seems almost as if French is throwing away any pretext of scientific objectivity, and implying that the purpose of his academic unit is to gather evidence for his pet theory that people have paranormal experiences because of psychological issues. This is the opposite of the way that a scientific academic unit should be operating, which is to conduct impartial, unbiased, objective research in which conclusions are derived after research rather than before it, and in which preconceptions do not influence analysis and experiments. This is a very weak argument. First, the mere “sense of a presence being nearby” is a pretty minor part of ghost reports. The main reason why ghost reports may be worthy of attention is that people actually report seeing ghosts. The mere “sense of a presence being nearby” is just a kind of interesting detail that normally attracts little attention from researchers into ghost reports or the popular press. Explaining that part of ghost reports would still leave one with the far larger problem of explaining reported sightings of ghosts. Secondly, it is clearly fallacious to mention feelings during brain surgery to try to explain anomalous feelings when one is not having brain surgery (because 99.9% of ghost reports come from people who are not undergoing brain surgery). Third, it is absurd to be referring to people's experiences during brain surgery as support for anything, because the last I heard people are totally unconscious when brain surgery is performed on them. French then attempts to suggest that ghost sightings may be hallucinations, saying "we could all have them under appropriate circumstances." He seems to insinuate that ghost sightings are produced by fear. An interesting hypothesis – you go to a haunted house or graveyard, and then you get scared so bad, you start hallucinating. However, the idea is pure bunk. 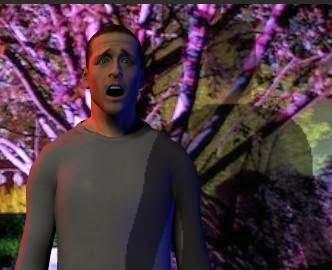 There is no significant evidence that fear can cause people to have visual hallucinations. This link discusses the reasons for hallucinations, mentioning things such as brain disease, substance withdrawal (such as an alcoholic's delirium tremens or DT's), drowsiness, poisoning, taking certain types of drugs, sensory deprivation, and so forth. There is no discussion at all of hallucinations caused by sudden fears, because there is no real evidence that such a thing can happen. This link mentions dozens of causes of visual hallucinations, but does not list fear or anxiety as a cause. This PDF discusses dozens of causes of auditory and visual hallucinations, but does not mention fear or anxiety. I was there in my foxhole, and the enemy started to shell us with their artillery. I could see and hear shells exploding not far away. Then suddenly I saw a ghost in my foxhole. As I walked down the narrow dark alley at night, I saw the shape of a big hulking guy ahead of me. I was terrified that he would mug me. Then suddenly I saw a ghost in the alley. I was driving when the road was rather icy. Suddenly my car went into a 180 degree spin. I was terrified! Then suddenly I saw a ghost in my car. Nobody makes reports like these, because fear does not cause people to have visual hallucinations of ghosts or anything else. Looking at it from a Darwinian standpoint of natural selection, it is easy to understand why evolution would probably never allow a situation where fear was the cause of hallucinations. Having hallucinations in a threat situation would lower the chance of an organism surviving. If you have a hallucination while faced with some threat such as an attacking animal, you are less likely to focus on the real threat and survive the situation. Organisms which had such hallucinations would be more likely to die out, less likely to pass on their genes, and more likely to become extinct. French also advances a suggestion of mistakes spreading in a fear situation. He gives an example: “If you’re in a reputedly haunted place and someone says they hear footsteps someone will believe them.” So if me and my friend are at a haunted house we think is empty, and my friend says he hears unexplained footprints, that may explain why I think there are unexplained footprints, but it doesn't explain why my friend reported the unexplained footsteps in the first place. Not a very fertile hypothesis. One reason why French's explanations fall flat is that most reports of ghost encounters do not occur at a moment when people are scared (although fear often follows such claimed encounters). One common type of ghost encounter seems to be what are called “crisis apparitions,” a type where one person reports unexpectedly seeing an apparition of a recently dead person. Cases of this type were exhaustively documented in the classic work Phantasms of the Living (which can be read here). There are also sites that are involved repeatedly in ghost reports, but the “ghost encounters” at such sites seem to occur at unpredictable, random intervals, with typically years between reports. In the latter cases, the reported ghost sighting typically occurs as a sudden surprise, not as something that was preceded by fear. As I reported in this post, one of the stereotype-busting findings of a recent study on ghost sightings is that 64% of the people reporting sightings said they occurred “during mundane or normal times in their lives.” This is not a finding compatible with the idea that fear causes ghost sightings. Along with near-death experiences, the phenomenon of apparition sightings is an ongoing thorn in the side of materialists who rigidly cling to the idea that consciousness cannot exist outside of the brain. Conceivably one day after we unravel all the mysteries of the brain, we might have some purely psychological explanation of ghost sightings. But judging from his newspaper interview, French doesn't seem to have got to first base at such a task. If he wants to score on the matter, my first suggestion is that he start out by abandoning the blatantly ideological “we've already made up our mind” attitude glaringly shown on his academic unit's web page, and that he investigate his subject matter in an impartial, objective, unbiased manner, like a good scientist should. 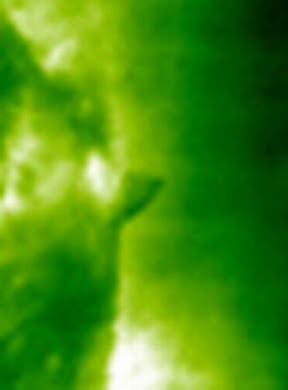 The Mysterious Universe web site came out yesterday with a story entitled “NASA Photo Shows Earth-sized UFO Orbiting Sun.” That is quite a sensational claim. Let's take a close look at the matter. Now, at first glance the photo may seem fairly convincing. It basically looks like half of a gigantic bowl, one that is either entering into the sun, or orbiting behind it. Seeing this “half a bowl” shape makes one think of a flying saucer, but it actually is not half of the classic flying saucer shape, but merely half of a bowl shape (as the visual below shows). But there is at least one problem: the “half a bowl” shape does not look any different than the nearby solar material. The “half a bowl” is a shade of green very similar to nearby solar material that is part of the sun. So we must consider that this “half a bowl” shape may be merely a solar prominence, which is when the gas from the sun gushes out beyond the outer circumference of the sun. 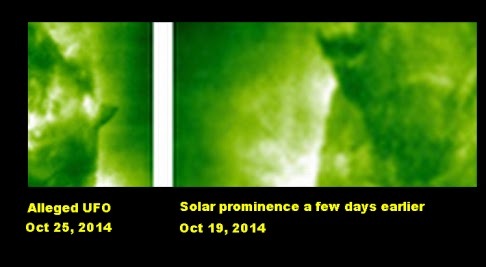 But is it very improbable that we would see a solar prominence as big as this given the current solar conditions? I could show a photo of a solar prominence showing gas shooting out much farther than this “half a bowl” shape. But that might not be fair, because perhaps such a photo was taken at a different stage in the solar cycle. The “half a bowl” shape and the Oct 19th prominence are about the same shape, size, and color. The only difference is that the Oct 19th prominence is a little more irregular-looking, and has a little kind of curl at its end. 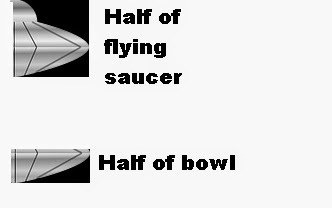 Is this little difference enough for us to conclude that the “half a bowl” shape is actually a UFO? Certainly not. What we simply seem to have here is a solar prominence that coincidentally seems to have a somewhat artificial-looking “half a bowl” shape. You are unlikely to see something this artificial-looking if you look at solar prominences on ten or twenty consecutive days. But if you look for fifty or a hundred days, you would have a decent chance of seeing something as artificial-looking as the alleged UFO. It is hard to believe that extraterrestrials would create a spaceship the size of an entire planet. If they did create such a spaceship and send it to our solar system, we probably would have detected it, because it would be so huge it could hardly escape the attention of astronomers. If extraterrestrials did send such a spaceship into our solar-system, it is very hard to believe that they would send it so close to the sun, where it would presumably be damaged by the extreme heat, and would be in great risk of being dragged into the sun by the sun's enormous gravity. As indicated in previous posts, I am certainly quite open to ideas that extraterrestrials may be running around here and there in our solar system. But because of all these reasons, I must for the moment reject this “earth-sized UFO near the sun” theory. This photo is cropped from a spot on the bottom left corner of the very large image here. There were also two consecutive days on which a Mars rover showed a mysterious light on the horizon. Skeptics claimed that both were caused by cosmic rays that coincidentally appeared near the horizon, although a calculation suggests that the chance of this happening on two consecutive days is something like 1 in a million. 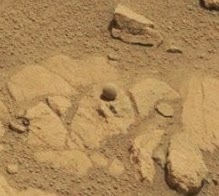 Skeptics have tried to debunk this photo by claiming that it is a screw imprint from the APXS instrument on the Opportunity rover that took this picture. My previous blog post refutes this hypothesis. As I explain in that post, according to the NASA activity log for the Opportunity rover that took this picture, the APXS instrument was not used at the site where this photo was taken until the night after the photo was taken. That means this strange “X within a circle” cannot be explained as a screw imprint. So we seem to have some anomalous observations on the planet Mars. It is time to look at what “out of the box” explanations might help to explain such unusual sightings. When considering such possibilities, we should consider a very wide spectrum of possibilities. Below are some of the possible things that might be causing some of these strange observations. This is the simplest explanation, although it seems to stretch credulity. For example, while it may not be too implausible to imagine that an X shape would coincidentally appear on Mars due to a random arrangement of matter, and while it may not be too implausible to imagine that somewhere else a circle shape would coincidentally appear on Mars due to a random arrangement of matter, it seems very implausible that an X shape would coincidentally appear within a circle shape only slightly larger, due to a random arrangement of matter (as shown in the “Celtic cross” photo above). It could be that some of the things we are seeing on Mars are remnants of an ancient civilization that naturally arose there. This possibility is rather farfetched, but not totally unthinkable. We know that billions of years ago Mars was a lot more earth-like than it is now, and scientists think that it might well once have had flowing water. But scientists think that if flowing water existed on Mars, it only existed during a small fraction of the planet's history. For most of the past 4.5 billion years, Mars has apparently been very arid. Judging from the history of evolution on Earth, there would not have been time for intelligent life to have evolved on Mars during the time when there was lots of water around. But it is just barely possible that life could have got a foothold on Mars billions of years ago, and then life could have moved underground as conditions on the surface gradually worsened. It could be that for billions of years life has been evolving underground on Mars, where there may be more water (along with shielding from cosmic rays). Just possibly, intelligent life and a civilization may have developed. Subterranean creatures on Mars might occasionally journey to the surface of the planet, just as earthly scuba divers occasionally visit the bottom of the sea. They might occasionally leave some junk behind, just as earthly scuba divers sometimes discard things at the bottom of the sea. It could be that some of the things we are seeing on Mars are remnants of a colony or base that appeared on Mars because of interstellar colonization. Intelligent life could have arisen on some planet revolving around another star, and creatures from that planet could have eventually traveled to our solar system, establishing a base or colony on Mars. This possibility averts the objection that there probably wasn't enough time for intelligent life to have arisen on Mars itself. One might object that if such a colony or base had been established on Mars, it would have left large traces that we would have detected by now – that such traces would have shown up in pictures taken by various Mars orbiters. Such an objection is not necessarily decisive. Extrasolar colonizers might have abandoned a colony set up on Mars, and might have decided to remove most traces of it, like natural park visitors cleaning up their campsite to leave their campsite area in its natural state. But such a cleanup may not have been perfect, and a few traces might have been left behind. Or, a colony or base might have become uninhabited because of mission failure, a plague, a supply problem, or some other reason. Then natural geological processes (and the ferocious Martian sandstorms) might have covered up almost all traces of the colony or base, except for a few scattered remnants. It is possible that our planet is under surveillance by extraterrestrial visitors, as suggested by the many UFO sightings. Perhaps they don't want to suddenly land a flying saucer on the White House lawn, because the sudden shock might be too much for us. So is possible that such visitors are trying to gradually wake us up to their existence and presence. Having UFO's appear in our skies would be one way to do that, but it is almost as if we have stopped paying attention to such sightings. So extraterrestrial visitors might be using other techniques to gradually alert us to their existence. One such technique might be placing artificial-looking objects on the surface of Mars, in the same places that the two Mars robotic rovers (Opportunity and Curiosity) are exploring. The plan might be to place more and more of such objects in the path of the robotic rovers, with increasingly artificial objects appearing. Eventually, perhaps, the whole world will gradually be alerted that man is not alone in the universe. Then, when we are psychologically prepared, extraterrestrial visitors might finally appear in some undeniable way such as a White House lawn landing. It is fairly easy to adopt the previous hypothesis to make it fit more old-fashioned theological assumptions. We just replace “extraterrestrials” with “God” or “angels.” We can imagine that some divine or angelic presence wishes to leave some kind of sign, and is using Mars as part of that plan. Why Mars? Because it is harder to explain away any object left on Mars. If a divine or angelic being were to leave some physical sign on our planet, skeptics would immediately say: someone faked it. But if an object appears on Mars, there is no possibility that someone faked it. This possibility is not as outrageous as it may seem at first. Some people have reported that during seances (in which communication allegedly occurs between the dead and the living), there are sometimes physical objects that mysteriously appear – things such as coins and flowers. Such objects are called apports. Some believe that there is a spiritual dimension or plane that intersects or overlaps our physical reality, and that physical objects can sometimes be passed from this spiritual dimension or plane into our physical world. If that could happen on our planet, it could also happen on Mars. Imagine that when people die, they go to some “other side” or dimension that overlaps or intersects our physical reality. Beings in such a dimension might want to leave a sign to our physical world that they exist. A physical sign left on our planet would probably be ignored or explained away, but an artificial-looking physical object left on Mars (and photographed by one of the Mars robotic rovers) would be much more likely to be noticed. To many this idea will seem like a kind of concept clash. Just as we regard churches as only places for spiritual activities (and not places for chemistry experiments), we tend to regard Mars as a kind of scientist's playground exclusively for them, where any type of spiritual phenomena could not occur. But such an idea may be invalid. If there is an external spiritual reality, it might make itself known in any part of our solar system, not just on our planet. So the idea that “paranormal phenomena might occur on Earth, but never on Mars” isn't necessarily justified. We must consider one other possibility designed to help materialists sleep better at night – the strange objects observed on Mars might be pranks. We don't know what NASA employees or subcontractors become involved with the NASA images before they are released on the NASA web site. It is just possible that someone is manipulating the pixels before they are released, inserting strange things and having a good laugh when others draw attention to them as amazing signs. This hypothesis can be a “last resort” for the skeptical. While mentioning this possibility, I can also note that possibilities 4, 5, and 6 do not actually require material manipulation of objects on the planet Mars. Each of these possibilities could take place by some higher power merely manipulating the pixels that are transmitted from Mars to Earth. 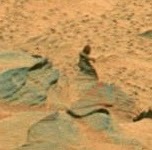 If you were some higher power wanting to make it look like something special was on Mars, you might merely manipulate the image pixels that are arriving on Earth from Mars, rather than physically manipulating something on Mars. Part of a More General Phenomenon? It is entirely possible that the strange objects discovered on Mars are aspects of a more general phenomenon, a phenomenon in which some unearthly intelligence or intelligence very gradually unveils its presence to humanity. Other aspects of the same phenomenon may include crop circles, orbs, and UFO's. We may see such strange phenomena occurring more and more often, with more and more dramatic manifestations. Eventually we may realize it is all part of some process by which some very patient unearthly intelligence (extraterrestrial or spiritual) very slowly makes itself known to us. 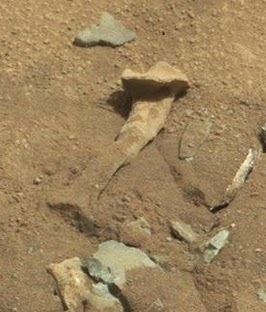 I will not be surprised at all if we start to see more and more cases of artificial-looking things on the planet Mars. The photograph above was taken by the Opportunity rover, one of the two robotic rovers now on Mars. The NASA web page giving the photo says it was taken on Sol 3720, which corresponds to July 11, 2014. 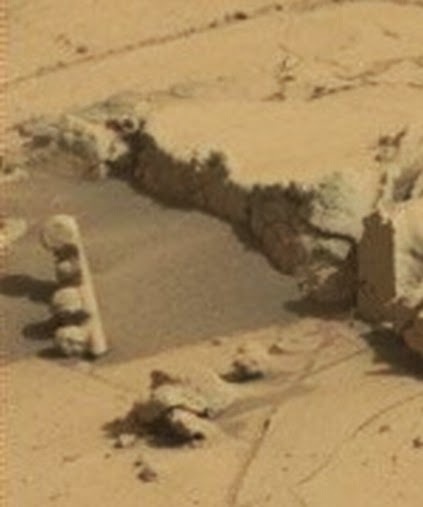 If you do a Google search for “Celtic cross on Mars,” you will find quite a few Internet discussions about this photo. At first sight the picture seems to indicate something sensational – what looks like an image of something artificial on the surface of Mars, perhaps some artifact from long ago. Now here is the ingenious explanation of the skeptics. 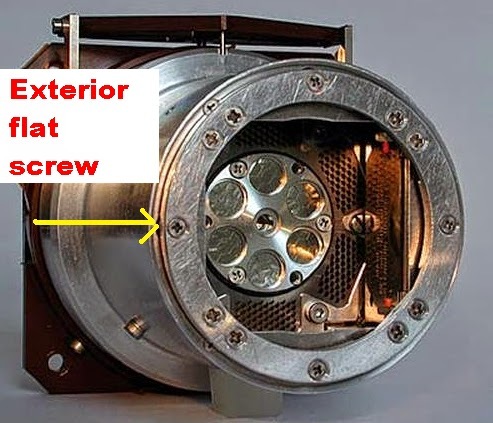 They noticed that in the image above, there are exterior flat screws, which have an “X within a circle” shape similar to the “Celtic cross” shape discovered on Mars. The skeptics then suggested that the “Celtic cross” shape was caused by a “screw imprint” when the APXS instrument made contact with the surface of the planet Mars. Some initial visual analysis leads one to be doubtful about this explanation. 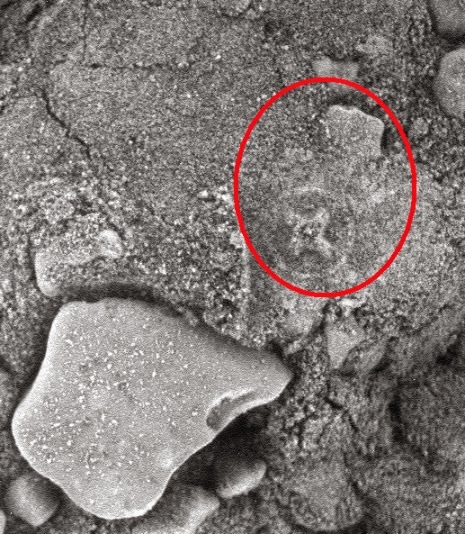 The APXS instrument has quite a few screws that might make an imprint, but we see only one “X within a circle” in the Mars image of the “Celtic cross.” Also, there seems to be a kind of handle shape attached to this “Celtic cross,” something that is not explained by the “screw imprint” hypothesis. Also, the “X” part of the “Celtic cross” appears to be higher than the nearby rock or soil, an effect one would not see if the shape was produced by a screw imprint. The real test of the “screw imprint” hypothesis is the timing of the Opportunity rover's activities. In order for this explanation to hold up, it would have to have been that the Opportunity rover was actually using the APXS instrument at the particular spot that the photo was taken, before or during the Martian day of July 11, 2014 (3720) when the photo was taken. What do the NASA logs say about this? The one sol of in-situ (contact) science was the first sol of a two-sol autonomous 'touch 'n go' where the rover used the robotic arm (the 'touch') on Sol 3720 (July 11, 2014), to collect a Microscopic Imager mosaic of the surface target 'Trebia,' followed by an overnight contact integration measurement performed by the Alpha Particle X-ray Spectrometer (APXS). Then, during the following Martian NIGHT (as indicated by the word “overnight,”) the APXS instrument was used (presumably to make some type of contact with the ground), which was the only time that instrument was used to make contact with the ground during the period between July 9th and July 17th. So the official NASA chronology refutes the glib “screw imprint” explanation for the “Celtic cross” on Mars. Apparently the mysterious “Celtic cross” could not have been produced by the APXS instrument. We are stuck with a big mystery. What in blazes is an X shape within a perfect circle doing on the planet Mars? In my next blog post, I will theorize about several possible explanations for this Martian surface anomaly and other strange anomalies on the Martian surface. These explanations will involve various awe-inspiring possibilities. 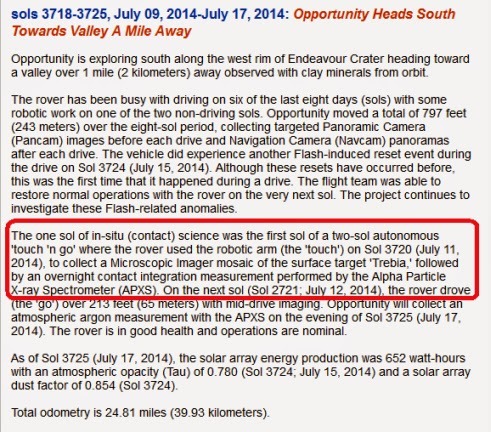 Postscript: If you read the Opportunity activity log here (the same link given above), it becomes clear that it is something like standard operating procedure for the Opportunity rover to travel to a spot, use the Microscopic Imager unit first to take pictures (the unit that took the "Celtic cross" picture), and then later (usually overnight) to use the APXS instrument (the unit claimed as the source of the "screw imprint") on the same spot. It's easy to see why that order is preferred. Since the APXS has to make contact with the surface, it's better to take the pictures first, to capture the natural, undisturbed look of the soil and rocks being studied (rather than take pictures of the soil after it has been touched and zapped by the APXS with its x-rays and alpha particles). 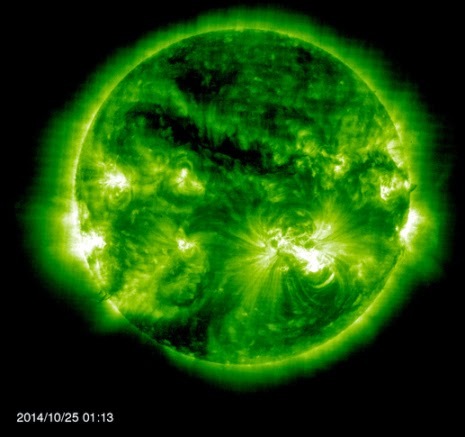 Some excitement has been raised recently about a scientific study involving solar x-rays. The popular press has been gushing forth with statements like this: “British scientists believe that they may have finally found the first direct evidence of dark matter.” But such statements are exaggerations. 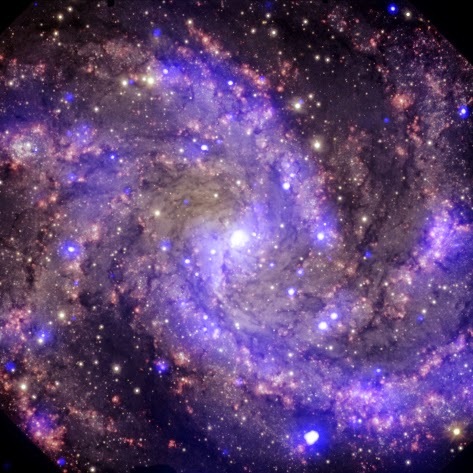 The new study does not give direct evidence for dark matter. Direct evidence for a new type of particle is found at places like the Large Hadron Collider, which produced evidence for the Higgs boson particle. The new study was something completely different, a study of solar x-rays. 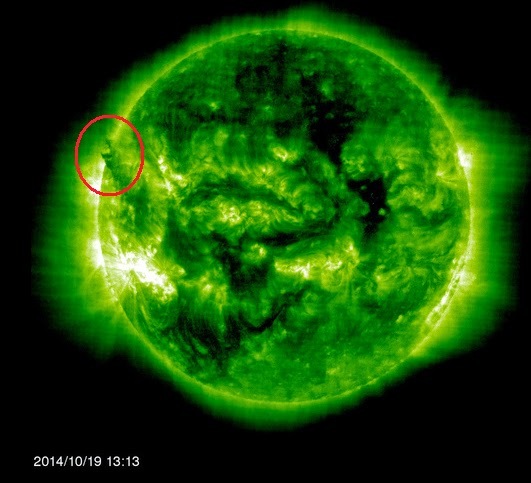 The authors detected a seasonal variation in solar x-rays, one that is anomalous. As we normally think of the sun, it is something that goes about its business without the slightest knowledge of earthly seasons – so how could there be such a seasonal variation? There are a variety of possible explanations that the authors can think of, which are listed in Table 4 at the back of their paper. The explanations include solar wind charge exchange, “galactic background, local bubble,” residual soft proton flux, keV electron flux, Earth aldebo, and Compton-Getting effect/X-ray dipole. But the authors seem to prefer a different explanation – that their observations are caused by a type of undiscovered particle called axions. 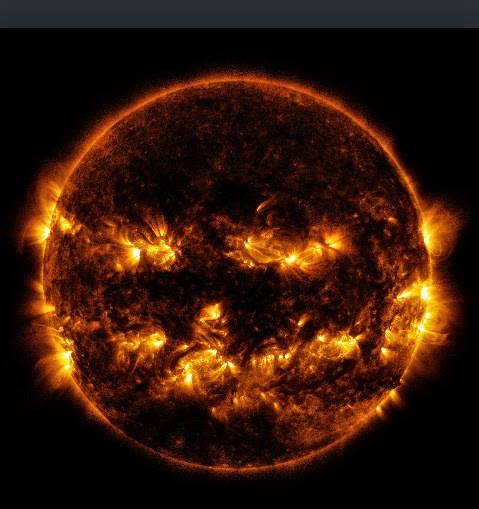 Their suggestion is that the sun may be producing these axions, that they may be interacting with our planet's magnetic field, and that this may be the explanation for the seasonal variability. It's the same old story we see again and again these days. First, scientists make a modest statement, which in this case is the statement made in the scientific paper, which merely says that “potential axion signatures” have been found. Then science writers (eager to announce something important that gets more web hits) inflate this into something much bigger, in this case “the first direct evidence of dark matter.” For one thing, the new study does not provide direct evidence for any type of matter, either dark or normal, because it is a study of energy not matter (X-rays being a form of energy). For another thing, as I mentioned above there are quite a few alternate ways of explaining the observations without assuming the existence of axions. Moreover, even if axions do exist, that does not confirm the theory that dark matter is a key component of the universe. Axions are merely a candidate dark matter particle. If we knew that the sun produced some axions, that still would not tell us whether dark matter plays a major role in the universe, as we still wouldn't know about how much of a relation there is between dark matter and axions, how many axions there are, how much dark matter there is, and so forth. X is consistent with Y. This means very little. It does not mean that Y is true, nor does it necessarily imply that Y is probably true. A hundred and one weird conspiracy theories are consistent with the assassination of John Kennedy, but it doesn't mean that any of them are true or probably true. X suggests Y. This is a stronger statement, but basically all that it says is that X brings to mind Y, without asserting Y's likelihood. Lots of things suggest other things that aren't really there, as when you look at a cloud in the sky and see a face. X is evidence for Y. This is a still stronger statement, which pretty much indicates that Y is likely. But since evidence can be misleading, it still leaves the door open that Y may not be true. X proves Y. This is the strongest assertion, which asserts that Y is definitely true. I may note that while the new X-ray observations may be consistent with dark matter or axions, they are also consistent with something radically different: astrology! The authors have provided evidence suggesting a weird unexplained connection between the sun and the seasons. I can imagine an astrologer's reaction: why, of course, they're all connected along with the zodiac and your birth sign, just as we astrologers have been saying for centuries. Don't get me wrong: I am not a believer in astrology. I merely mention this to point out that it means quite little to say “X is consistent with Y,” because X may also may be consistent with a hundred and one other things you don't want to believe in or never thought of. As you can probably figure out, I am still skeptical about dark matter. I regard it as a possibility, but do not think its likelihood has been demonstrated. One of the reasons I am skeptical is the severe problem of reconciling dark matter theory with observations of dwarf galaxies, as discussed here and here. Another reason I remain skeptical is that scientists keep changing their story about dark matter. Six days ago an article on space.com said, “Scientists have found that the Milky Way galaxy holds half as much dark matter...as scientists had previously thought.” Beware of a claim when someone keeps changing his story. If someone knocked on your door one day offering to sell you a jewel that he claimed was worth 2000 dollars, you wouldn't exactly have confidence in him if he appeared the next day claiming the jewel was actually worth 1000 dollars. Floyd Baxter was a Denver bus driver who liked to unwind from the stresses of his job by hiking in the mountains. One day he hiked deep into the mountains, and saw another hiker in the distance. Suddenly Floyd heard a strange scream. The hiker had fallen off a treacherous mountain cliff. Floyd rushed to where the hiker was. He was surprised to see the hiker was wearing some kind of strange helmet looking like the helmet of a space suit. Floyd looked into the helmet and saw a strange face unlike any he had seen before. The eyes were larger than human eyes, and the nose was a weird kind of triangle slit. The skin was salmon-colored. Floyd thought to himself: what the devil have I stumbled on to? Some kind of weird alien hiker? It was apparently an alien being, an extraterrestrial from some other planet. The poor creature had apparently died in the fall from the cliff. For some time Floyd just stood in wonder looking at this amazing site. He tried speaking to the alien creature, but got no response. He tried gently shaking its arm, but there was no sign of life. Floyd noticed that the alien wore a kind of vest-like apparatus or device that was about the size of a life jacket used to keep swimmers afloat. The device fitted over the alien's arms much as a life jacket fits over a man's arms. At the front of this vest-like device there were dozens of small buttons. After great hesitation, Floyd finally decided to remove this vest-like device from the alien's body. He imagined that the vest-like apparatus might be some kind of a supply holder, and that inside it might be something he could use to help save the life of the alien – perhaps some kind of life-saving potion he could pour into the creature's small mouth. So holding the machine, Floyd pressed one of the buttons on the vest-like apparatus. Suddenly Floyd found himself transported instantly to another planet. Astonished, Floyd looked around. He could see no sign of the place he had found the alien, and no sign of the alien. He was now at some location he had never before been to. It was apparently some location that was not even on planet Earth. Looking ahead he could see two mighty glaciers that fed into the waters of a sea. The sea water was bluer than any he had ever seen. In the sea he saw what looked like two large islands. The temperature was very low. Floyd knew from the moon in the sky that this location was not on Earth. The moon in the sky did not look like any moon he had ever seen. Floyd asked himself: how could this have happened? Then he had an idea. Perhaps the machine he was holding, the machine he had taken from the alien creature, was some kind of instantaneous transportation device. Perhaps rather than using big spaceships to travel to different planets, the alien was simply using some kind of amazing machine that could instantly transport a person to an entirely different planet. The temperature was too cold, so Floyd decided that he might as well test his idea immediately. He decided to press another one of the buttons on the machine. Then instantly Floyd again found himself transported to another planet. 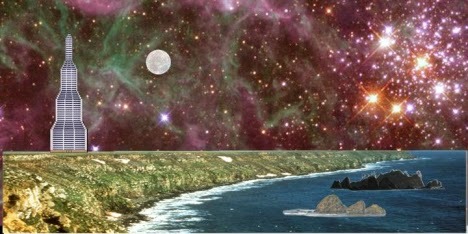 This planet was much warmer, and it was nighttime, but a night unlike any Floyd had ever seen. The sky was ablaze with hundreds of stars far brighter than any you could see on planet Earth. Ahead of Floyd was a building, and Floyd began to walk towards it. But out of the building there came creatures unlike any Floyd had ever seen. They looked like elephants with spider heads. Terrified, Floyd thought to himself: I'm getting the hell out of here. He pressed another button on the machine. Suddenly again Floyd was instantly transported to another planet. He found himself in a totally different landscape. It was a lovely valley flanked by mountain peaks. Floyd saw some strange-looking houses and a lake ahead. He walked towards them. Near the lake Floyd encountered the planet's inhabitants. They were beautiful-looking creatures who had whitish-blue skin. One of the creatures seemed to say “Hello” to Floyd, but it was not through language, but through telepathy. Floyd tried to talk to the creature, but it was useless. But then he tried just thinking his thoughts. It worked! Floyd could talk to the creature purely through telepathy. Floyd stayed at the planet for two days. He found the creatures on the planet to be loving and trusting. He told them he was from another planet, and they believed him. Floyd found the planet so delightful he was hesitant to leave. But eventually he decided he really should get back to his home planet. So he decided to keep pressing more buttons on the machine. Floyd thought to himself: one of these buttons must be programmed to transport me to Earth. Floyd pressed another button on the machine. Again, he was instantly transported to another planet. This time, the planet was his home planet. He found himself back on Earth, near the same place he found the dead alien and the alien machine. Floyd hiked back to his car, and drove home. Floyd then thought: wait until everyone hears about this! First, Floyd told his friend Charley all about what had happened. Charley refused to believe a single word of his story. Then Floyd called up a newspaper and got a reporter to come over. Floyd spent three hours telling all about what had happened. Two days later the newspaper published the story: Bus Driver Claims to Have Visited Other Planets. But no one seemed to believe the story. Floyd became an object of ridicule and contempt. The bus riders would come on his bus and whisper: that's him, the crazy bus driver who thinks he went to other planets. Children from Floyd's neighborhood would stand outside his house and make scornful jokes about Floyd. When they saw him come out of his house, they would taunt him by saying things like: Hey, big-shot, have you been to any new planets today? The bus company called in Floyd and told him that since he was either a huge liar or someone suffering from hallucinations, he could not be trusted to perform his bus-driver job. Floyd was fired. Unable to keep up with his house payments, he received a foreclosure notice from the bank. Floyd thought to himself: what can I do? Then he remembered something very important. He had brought the alien machine back with him in his car, and had left it in the trunk of his car. He had also remembered which button he could press to return to the planet of the beautiful, trusting telepathic creatures. Floyd remembered those creatures he had visited for two days. They were so loving, so trustful, and so innocent. They seemed so different from the humans he had recently dealt with. Floyd opened the trunk of his car, and took out the alien device. Preparing to return to the planet of the telepathic creatures, Floyd thought to himself: as soon as I get back to that planet, I'm throwing away this damn machine. We may not be more than a few decades away from discovering proof of extraterrestrial intelligence. Various people have speculated on what the cultural effects will be of such a discovery. A common idea is that if we finally discover some other intelligent life out there in the universe, it will be a shattering event for traditional world religions. The idea is sometimes suggested that the discovery of intelligent extraterrestrials might cause a sudden collapse in confidence in long-standing world religions, causing a large fraction of their followers to abandon their faiths. But such an idea may be unfounded. Rather surprisingly, the discovery of extraterrestrial intelligence may not have all that huge an effect on the world's traditional religions, for several reasons I will now explain. In physics inertia is the resistance of an object to a change in its state of motion, proportional to the object's speed and mass. We can use the same idea to identify a kind of ideological inertia – the resistance of a person to a change in his beliefs. People all over the world of many different viewpoints have a huge amount of ideological inertia, including both believers and total non-believers. The longer a person has been believing in some particular doctrine, the more ideological inertia he will tend to have. We can visualize ideological inertia as kind of like a great big boulder that is very hard to move unless a gigantic force is applied. It seems that people will be unlikely to change long-standing beliefs unless something incredibly dramatic happens to them – a “knock you over the head with a 2 by 4” kind of event. If we were to discover some unmistakable signs of extraterrestrial intelligence in some far off solar system, that probably would not be sufficient to cause that much of a belief change in people who have held old-fashioned religious beliefs for decades. It might be that such a discovery should cause people to reassess many of their beliefs, but it probably wouldn't. Before we knew there was one intelligent species, mankind. Now we apparently know that there are two. No big deal – two is not much different than one. Old-fashioned believers could use a similar trick to kind of pretend that any extraterrestrial civilization discovered far away is “irrelevant,” because of the difficulty of communicating with it, or the unlikelihood of it visiting our planet. People of all viewpoints (both believers and skeptics) show an almost limitless capacity for explaining away or dismissing things they don't want to believe it. If extraterrestrial intelligence were discovered in a distant solar system, I imagine that the defenders of old-fashioned viewpoints would come out in force, and pull out every argumentative trick in the book to cast doubt on the discovery. They might argue that the discovery was a misinterpretation of the data, or that the discovery was just some story being put forth by astronomers eager to get more funding for their pet projects. The only type of discovery of extraterrestrial intelligence that would prevent such a maneuver would be if giant alien spaceships were to appear in the skies of many of our cities. If people didn't buy the explanation that the discovery of aliens was a misinterpretation or a plot by fund-seeking scientists, defenders of old-fashioned religions could always use the last resort of arguing that the evidence for extraterrestrials is all just a deception by Satan and his cohorts. Outsiders would cringe and laugh at such an explanation, but within a particular religion such an explanation might seem plausible. It also seems that whatever was discovered in terms of extraterrestrial intelligence, old-fashioned believers would try to somehow make it seem compatible with their own religious beliefs or scriptures. It's been said that you can find a Bible verse to support almost any opinion. That may be an exaggeration, but no doubt after the discovery of extraterrestrial intelligence, people would scour the Bible looking for some verse that could be cited as a prediction or foreshadowing of such a discovery. Never mind the fact that the Bible makes no mention of extraterrestrial life. Scriptural enthusiasts would probably find some murky passage that they could claim was a prediction or foreshadowing of the discovery. There are all kinds of defense mechanisms that old-fashioned believers could and probably would use to minimize the shock of the discovery of extraterrestrial intelligence. So in the short-term (say, 5 or 10 years), such a discovery might have relatively little effect on the world's major religions. But in the much longer term, after people had many years to reflect on the implications of the discovery, the impact might be much greater. This week a scientific paper was published in the journal Resuscitation announcing results of the long-term AWARE study which was the largest ongoing study on near-death experiences. Let's look at what the study found, and also look at its results in context, putting the study in perspective. The study was co-authored by more than 30 different researchers from more than a dozen colleges and universities. The AWARE study may well have been motivated by previous accounts of near-death experiences, which first came to public light in the 1970's with the publication of Raymond Moody's book Life After Life. Patching together elements from different accounts, Moody described an archetypal typical near-death experience, while noting that most accounts include only some elements in the described archetype. The archetype NDE included elements such as a sensation of floating out of the body, feelings of peace and joy, a life-review that occurs very quickly or in some altered type of time, a passage through a tunnel, an encounter with a being of light, and seeing deceased relatives. 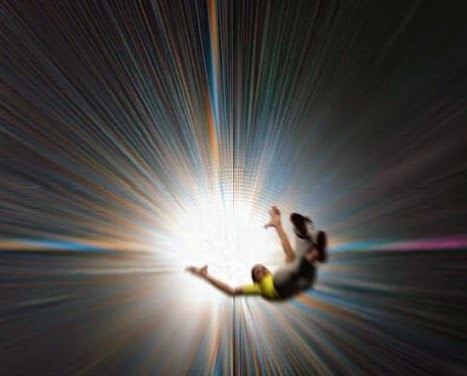 A previous study on near-death experiences was published in the British medical journal The Lancet in 2001. The study interviewed 344 patients who had a close encounter with death, generally through cardiac arrest. 62 of those reported some kind of near-death experience. 15 reported an out-of-body experience, 19 reported moving through a tunnel, 18 reported observation of a celestial landscape, 20 reported meeting with deceased persons, and 35 reported positive emotions. The AWARE in the AWARE study name is an acronym for awareness during resuscitation – the type of resuscitation that takes place when a person has a heart attack (cardiac arrest) and almost dies. The study collected data at 15 different hospitals, and was carried on over the course of four years. The study attempted to gather accounts of people's recollections in hospitals after they had very close encounters with death, typically during a heart attack or cardiac arrest. Over 2000 cardiac arrest cases were studied, and there were only 330 who survived to leave the hospital. Of those 330, only 101 met eligibility requirements, agreed to be interviewed, and also agreed to “stage 2” interviews. was looking up at a doctor doing chest compressions. One very unique feature of the study was its placement of little shelves in various hospital areas where cardiac resuscitation was deemed likely to occur. Each shelf had a unique symbol that could only be identified from someone looking at it from above. The shelves were designed to test previous accounts that patients had floated out of their bodies and looked at their bodies from above – accounts such as the famous Pam Reynolds account I will describe in a moment. The placement of these shelves was apparently futile. But the study did “hit the jackpot” in regard to one case of a 57-year-old patient who said that he floated out of his body while being revived from his cardiac arrest. The man said that a woman appeared in a high corner of the room, beckoning him to come up to her. He said that despite thinking that was impossible, he found himself up in the high corner of the room, looking down on the medical team trying to revive him. The man described specific details of the revival efforts, including the presence of a bald fat man with a blue hat, a nurse saying, “Dial 444 cardiac arrest,” his blood pressure being taken, a nurse pumping on his chest, a doctor sticking something down his throat, and blood gases and blood sugar levels being taken. He accurately described people, sounds, and activities from his resuscitation...His medical records corroborated his accounts and specifically supported his descriptions and the use of an automated external defibrillator (AED). Based on current AED algorithms, this likely corresponded with up to 3 minutes of conscious awareness during CA [cardiac arrest] and CPR. So here is a man who had a heart attack, and should have been unconscious during the medical efforts to revive him. Instead he accurately describes the details of what happened. Moreover, he claims that he observed these details while in a position above his body, in the high corner of the medical room. What we have here is what seems like a good-as-gold vintage “out of the body experience,” one with details that have been verified. This is an example of what is called a veridical near-death experience – one with observations that were subsequently verified. This is not at all the first time this happened, but merely the first time such a thing has been documented in a peer-reviewed paper co-authored by more than 30 different researchers from a dozen different colleges and universities. There have been several previous similar incidents that have been reported in the relevant literature. The most significant one was the case of Pam Reynolds, which was reported by physician Michael Sabom in his book Light and Death. Reynolds underwent a very drastic brain operation in which the blood was drained from her body, and her body was super-chilled. In such a state, consciousness should have been completely impossible. But Reynolds reported drifting out of her body, and observing the operation from above. She was able to verify details of what had happened during the operation, and described a very specific medical instrument that was used in her brain surgery. The Reynolds case is discussed in this Salon.com article, which also discusses the case (reported by social worker Kimberly Clark) of a woman named Maria who claimed to have floated out of her body during her operation. The woman claimed that while drifting around out of her body, she saw a particular type of shoe on a particular ledge of the third floor of the hospital. A subsequent check found just such a shoe at such a location. Then there is the account below of physician Lloyd Rudy who thought that a patient had died. He found himself discussing in a doorway with another doctor what could have been done differently to save the apparently dead patient. But after a while, the faintest signs of life were emitted from the patient. After further medical efforts, the patient was saved, and eventually gained consciousness. The patient then described how he had floated above his body, and watched the two doctors in the doorway discussing his case, and also described details that he should have been completely unable to have observed, because he had no vital signs at the time or even during the previous minute. These cases help put the AWARE study in perspective. The AWARE study has given us further evidence to support the conclusion that the human mind, spirit, or soul (call it whatever you want) can continue to exist outside of the body, and make observations at a time when conscious brain activity should have totally ceased. That does not prove that there is life after death, but it tends to strongly support such an idea. To conclude (as Bazian does in this article) that “overall this study provides no evidence to support the existence of an afterlife” is to stubbornly engage in knee-jerk denialism. Bazian attempts to explain away the study by saying, “It is perfectly plausible that people would continue to have thoughts and experiences while there is still oxygenated blood flowing to the brain.” But that explains nothing, because when a person has cardiac arrest, there isn't oxygenated blood flowing to the brain – that blood flow stops when the heart stops. Does the AWARE study prove life after death? No, but scientists also don't prove evolution merely by discovering another skull that is halfway between that of a man and an ape. Such a discovery is merely another piece of evidence belonging to a large body of evidence that points to the reality of evolution. Similarly, the AWARE study by itself does not prove life after death, but it is a substantial additional piece of evidence in a large and diverse body of evidence that suggests life after death. To read about more than ten other such types of evidence, read my recently authored book 50 Hints of Cosmic Purpose, which can be purchased through this link for $1. Arguments involving galactic colonization are often made when discussing how much intelligent life exists in our galaxy and our universe. One all-too-common line of reasoning goes like this: if intelligent life had arisen elsewhere in the galaxy, it would have already colonized the entire galaxy, and we would see signs of such intelligent life right now on our planet (or we would never have appeared because Earth would have been colonized first); therefore, man is the only intelligent species in the galaxy. This is a very weak argument that involves multiple fallacies that I will now discuss. According to Einstein's Special Theory of Relativity, nothing can travel faster than the speed of light. So this means travel between stars is going to take a long time. In fact, there are practical engineering reasons for thinking that a spaceship could not travel more than roughly about one fifth of the speed of light. This means that a trip between stars will probably take decades. This slowness of travel has two main implications. First it means that we should not imagine a galaxy being colonized in less than a period of millions of years. But it also means much more. It means that any unified coherent program of colonization is doubtful. The whole idea of any civilization setting out on a million year project may be entirely dubious. The slowness of interstellar travel also probably means that the galaxy can never really be colonized in the sense of being controlled in a unified way by a single culture. Imagine if Earth were to create colonies on planets revolving around other stars. The nearest colony would be about 4 light years away. The colonists would know that if they went their own way and declared their independence, it would take 4 years for the news of such an announcement to reach Earth. It would then take at least another 4 years before a spaceship came from Earth to punish them for their disobedience (and probably more like twenty years, because of the near-impossibility of traveling at anything close to the speed of light). Such a colony would therefore not feel that it was under very strong political control by Earth. Colonies that were farther away from Earth would feel even more free to do whatever they wanted. 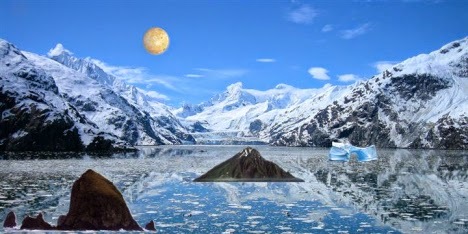 If an expedition from Earth established a colony on a planet revolving around a star that was fifty light years from Earth, then the inhabitants of that planet would know that they could declare their independence, and it would be at least 100 years before they would suffer any punishment – fifty years for the news to get to Earth, and at least fifty years for a punitive expedition to travel from Earth to the colony (but probably more like hundreds of years). The farther the colony was from Earth, the more its inhabitants would feel that they could do whatever they wanted without suffering any ill effects. If a colony was established 500 light years from Earth, and then declared its independence, it would have no worries at all about some punishment from Earth that could not arrive in less than 1000 years (500 years for the independence announcement to reach Earth, and more than 500 years – and probably thousands of years – for a punitive expedition to travel from Earth). This point is illustrated in the diagram below, in which the yellow dot at the center represents a planet attempting to colonize other stars. It would seem, therefore, that in terms of any type of system whereby one planet controls the galaxy, galactic colonization cannot even occur in a meaningful sense. Because of the slowness of interstellar travel, the zones of control of any planet would be relatively short, extending no more than a few hundred light years at most (only a tiny fraction of the size of the galaxy). Planets would realize that, and this realization would make them less likely to even attempt anything such as a colonization of the entire galaxy. Some planet starts out as the source of galactic colonization, sending a spaceship to colonize a planet around another star. 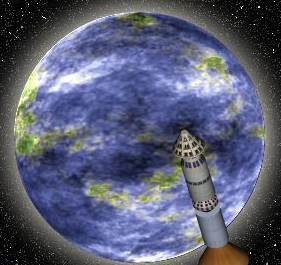 After that planet has been colonized, and has set up an elaborate technical civilization, the colonized planet then itself sends out a spaceship to colonize another star. The process continues over and over, until eventually the entire galaxy is colonized. One great weakness in such an idea is the fallacy of assuming that once each planet was colonized, it would continue to contribute to the overall program of galactic colonization, and also the fallacy of assuming that planets that had been colonized would stay colonized indefinitely. It's kind of like the fallacy of assuming that if you built a house on each continent, that those houses would still be around 1000 years later. In fact, there are all kinds of reasons why different planets that had been colonized would either “drop out” of a colonization program, or would revert to a non-colonized state because of the failure of colonies or the end of civilizations. One reason might just be an act of political independence. Some planets would just say, “To hell with it, we have no interest in sending out interstellar spaceships.” Then other colonies would simply just simply dissolve for the same reason that civilizations have dissolved or might dissolve – resource issues, wars, runaway technology, and so forth. Some planets might be conquered by neighboring planets. When colonies failed, a few million years of geological activity might be sufficient to remove all traces of them. The point is that you cannot assume that during the million years or more needed to colonize the entire galaxy, that each previously colonized planet would stay colonized. During that long million years, some fraction of the previously colonized planets would revert to being not colonized as colonies failed, civilizations fell, war took its toll, and so forth. We have no idea of what that fraction would be. It be could 10% or 20% or perhaps 90%. The fallacious argument discussed at the beginning of this blog post assumes that some galactic civilization would go throughout the galaxy and colonize all available colonization targets (all planets like our planet). But why make such an assumption? It is contrary to what we know about how humans act. In fact, every large country declares a significant fraction of the available land in its country to be “off limits” to development. Such land is put in natural reserves. 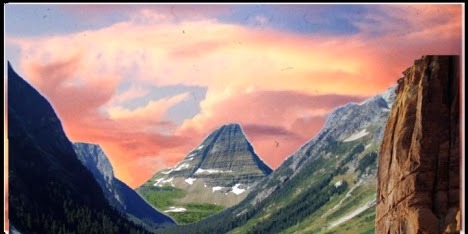 The natural reserves in the United States include the national park system and the national forests, which together make up a significant fraction of United States territory. China has a similar system. So why should we assume that interstellar colonizers would colonize every available planet in the galaxy without declaring some planets and some parts of the galaxy to be “off limits” to colonizers? We shouldn't. This possibility makes the whole “if they existed, they would have colonized us already” argument fall apart like a house of cards. It is entirely possible that our planet is part of a little section of the galaxy that some superior civilization has preserved as a reserve area not to be colonized. The fallacy discussed here is kind of a “fallacy of assuming unlimited utilization” similar to the fallacy of assuming that if you give a boy some crayons and one of those books with blank white pages, then necessarily if you return a year later all of the pages will have drawings or scribbles on them. 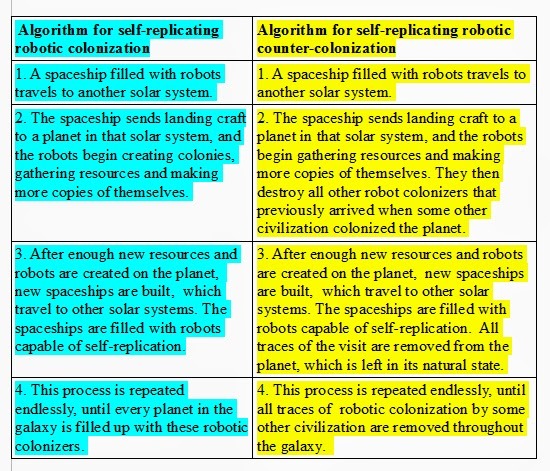 One version of the argument made at the beginning of this blog post is based on the idea of self-reproducing robotic colonizers. The argument goes like this: any civilization could send out a spaceship filled with robots to the nearest star, and when that spaceship arrived, those robots could use resources at that star system to create more robots, which could then travel to another star in their own expedition. The same thing could happen over and over again, and eventually these self-reproducing robots would “take over the galaxy.” But this hasn't happened, so therefore, the argument goes, we must be alone in the galaxy. The problem with this argument is the underlying assumption that such a galaxy-wide proliferation would actually be “taking over the galaxy,” or that it would be something that would actually have much of a net value. 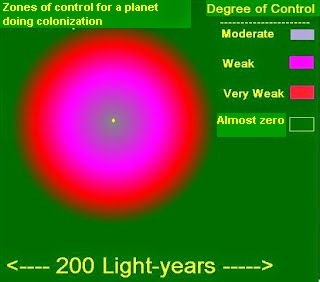 Because the effective zones of control of any planet would be relatively short (actually extending no more than 100 light years), sending out robots to inhabit planets across the galaxy would not really be “taking over the galaxy,” but really just “sending out squatters to the distant corners of the galaxy.” Having robots 20,000 light years away wouldn't actually give a planet any control over distant corners of the galaxy, because you don't have any real control when it takes 40,000 years to send a round trip message from a planet to those distant corners. According to the naïve calculations of some thinkers, we need merely calculate how long it would take colonizers from one planet to spread throughout the galaxy unimpeded. But such calculations ignore the important consideration that the efforts of any one planet to colonize the galaxy would probably be resisted by other planets. If intelligent life arose roughly the same time on hundreds or thousands of planets in the galaxy, we would not expect any one to take over the galaxy, because of opposition from other civilized planets that arose at roughly the same time. This is true even if one imagines robotic colonizers. One interesting point is that self-replicating counter-colonizers are just as easy to create as self-replicating colonizers. So imagine one civilization sends out an interstellar spaceship filled with self-reproducing robots instructed to build colonies, make more robots, and build more spaceships for more interstellar expeditions. The same technique can be used by some other planet to destroy the colonization efforts of the first planet. The second planet might launch such a “counter-colonization” interstellar spaceship filled with self-reproducing robots instructed to find resources, make more robots, and build more spaceships for more interstellar expeditions – not for the purpose of colonization, but simply for the purpose of destroying the robotic colonies created by the first planet. A planet might launch such a “counter-colonization” program if it noticed that some other planet was putting its robots all over the galaxy, and the first planet thought that such a program was a cancer that must be wiped out. Typical arguments involving galactic colonization are fallacious, and from such arguments we should not draw any conclusions about how common intelligence is in our galaxy. It is entirely plausible that there exist very large numbers of extraterrestrial civilizations in our galaxy, although it is still too early to assume with confidence that intelligent life is abundant in our galaxy. Orbs are strange circular features that have been showing up in flash photographs around the world since the invention of the digital camera. Some people think that orbs are evidence of a paranormal phenomena (which might or might not involve spiritual entities, since there are simpler paranormal possibilities such as undiscovered energy effects and “mind over energy” effects). Other people have attempted to debunk such thinking by offering mundane natural explanations for orbs. The two main theories to naturally explain orbs are a reflection theory and an “orb zone” theory maintaining that orbs are caused by tiny specks of dust very near the camera. In Part 1 of this 3-part series, I showed why the reflection theory is not a suitable explanation for the more unusual orbs that have been photographed, and in Part 2 I explained why the “orb zone” theory is also not a workable explanation for such orbs. There is still one matter to consider: an experiment done that some researchers claimed to be “definitive proof that orbs are not paranormal.” Of course, the very use of this term suggests that the experimenters were not really taking a scientific approach, as real scientists virtually never release experimental results and call them definitive proof for or against anything. A term such as “definitive proof” indicates that the experimenters were those with a strong experimental bias. But nonetheless let's take a look at this supposedly “definitive proof.” The experiments in question were a series of photographs taken with a special camera called the Fujifilm W1 3D. The camera in question has two lenses that take pictures simultaneously. It is a camera for taking photo pairs that one can use with a stereoscopic viewer, to get a 3D effect when looking at photos. There is a camera option that allows you to get separate photos of the image taken with the left lens and the right lens. Now the experiment in question is one that took orb photos using this camera. It seems that many of the orbs show up in one of the two pictures taken at the same time by the same camera, but not both of them. The experiments trumpet this as proof that orbs are really produced by dust. But is it really any such thing? No, it isn't (and may in fact be evidence that orbs actually are paranormal). Orb Theory 1: Paranormal orbs are produced by some unknown spiritual agents or energy agents that act on a “direct to device” basis, without actually producing flashes of light in the air. This theory is similar to the theory that EVP anomalies on tape recordings are produced by unknown intelligent agents that act on a “direct to device” basis, producing effects on tape recordings that you can't hear when tape recording. Orb Theory 2: Paranormal orbs are produced by some unknown spiritual agents or energy agents that are attracted to humans, and hang around very close to people taking photographs. The orbs appear in some paranormal way as small flashes, pulses or reflections that appear very close to the camera. Orb Theory 3: Paranormal orbs are produced by some unknown spiritual agents or energy agents that act several feet or meters away from humans, but send in a directional little pulse of light directly towards a camera lens, rather like someone might point a laser pointer directly at something. Orb Theory 4: Paranormal orbs are produced by some “mind over energy” effect of the human mind, that act on a “direct to device” basis, without actually producing flashes of light in the air. Orb Theory 5: Paranormal orbs are produced by some unknown spiritual agents or energy effects that cause something like a pulse, flash or reflection a few feet or meters away from the camera, but such a thing can only be seen where there is a particular angle between the camera lens and this pulse, flash or reflection. This is consistent with the fact that orb photos show up on such an irregular basis. Orb Theory 6: Paranormal orbs are produced by some unknown spiritual agents or energy agents that typically cause a circular flash of light to appear several feet or meters away from humans, something that a camera will capture regardless of the distance and camera angle. 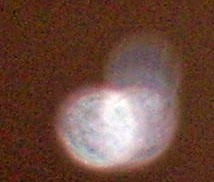 Now, how many of these are orb theories might seem to be damaged by the Fujifilm W1 3D experimental results? Only the last one (and as I will argue in a moment, even that is a misimpression). The first four paranormal orb theories are not at all discredited by these results. If orbs are produced on some paranormal “direct to device” basis (Orb Theory 1 and Orb Theory 4), we would not expect such an effect to work on more than one photograph when two photographs are taken simultaneously. If orbs are produced by agents very close to the camera (Orb Theory 2), we would not expect the Fujifilm W1 3D experimental results to be any different (in regard to whether orbs show up in both photographs) than they would be according to the “orb zone” theory postulating that orbs are caused by dust near the camera – because in both cases, the difference from the camera is about the same. 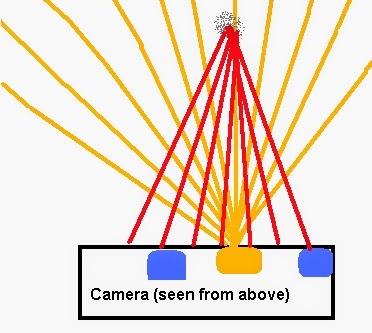 If orbs are produced by a directional pulse of light (Orb Theory 3), there would be no particular reason for suspecting that such a directional pulse would go towards both lens in a double-lens camera. If Orb Theory 5 is true, it might be that no more than one of the two lens of the Fujifilm W1 3D camera would capture the orb, since there would be a different angle between each of the lenses and the flash, pulse or reflection. But let us ask: are these results even consistent with the “orb zone” theory, that orbs are mainly caused by dust? It is doubtful that they are. Consider that theory. The theory holds that orbs are caused by dust particles only a few inches away from the camera, in front of the camera lens. So what should happen with a camera such as the Fujifilm W1 3D under the “orb zone” theory? The diagram below illustrates what should happen. The diagram shows the Fujifilm W1 3D from above. The blue units are the two different lenses. The yellow unit in the middle is the flash. The yellow lines are the light emitted from the flash. The gray blob is a speck of dust. The red lines are the light reflected from the dust. 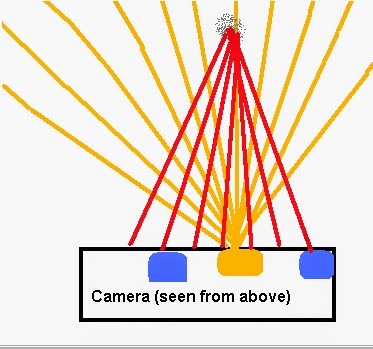 It seems that in such a setup, if an orb is produced (by dust very near the lenses), then the orb should be seen in the images taken by both lenses. But that is apparently not what happens in most cases, according to the Fujifilm W1 3D results. So far from being evidence that supports the “orb zone” theory that orbs are mainly caused by dust, the Fujifilm W1 3D results would seem to actually be incompatible with such a theory. The results, as have seen, are also compatible with 6 out of 6 theories assuming that orbs are paranormal. So to trumpet these results online as “definitive proof that orbs are not paranormal” is pure bunk. If anything, the results would seem to be in favor of the hypothesis that orbs are paranormal. So based on what we have seen here (and in my previous two posts in this series, Part 1 and Part 2), we are left with no good mundane explanation for the more interesting anomalous-seeming orbs that have shown up in so many flash photographs. It may well be time to consider extraordinary possibilities. That does not mean we have to leap inevitably to some “spirit emanation” hypothesis (although such a hypothesis still seems viable). It could be that orbs are simply some anomalous form of energy that scientists simply don't understand yet. Another possibility is that orbs are actually produced by the photographer himself, through some type of anomalous “mind over energy” effect. The long-running Global Consciousness Project that originated at Princeton University has accumulated evidence that humans have an anomalous effect on random number generators. If such a thing is possible, then it seems quite possible that humans can have an anomalous effect on flash photographs. But that is just an interesting possibility. At this time the long-standing phenomenon of orbs showing up in flash photographs must simply be regarded as an unsolved mystery. The glib explanations of the orb debunkers have not stood up to scrutiny.